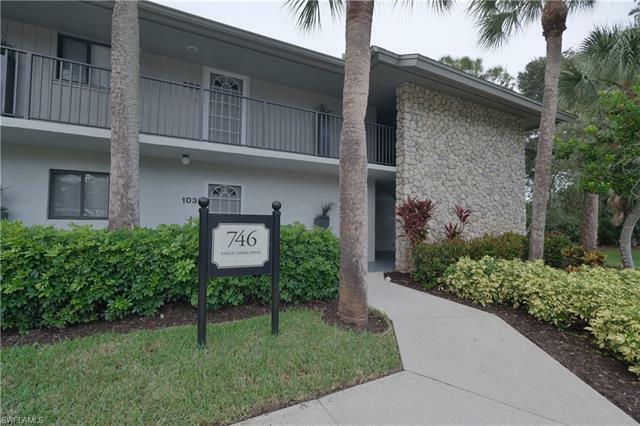 746 Eagle Creek Dr #204, Naples, FL.| MLS# 218079082 | Southwest Florida Residential Real Estate for Sale. $25, 000 Social membership is included to Eagle Creek! New A/C in November. This spacious and private, 1 bed 1 bath second floor end unit condo features a fantastic view of the golf course! Light and bright, the open concept is very desirable. Tile flooring in kitchen and living areas. Stainless steel appliances is a plus. Generous master bedroom and bath with dual entry for guest access. Lovely lanai overlooks the golf course. This condo is walking distance to the many amenities that Eagle Creek has to offer. Eagle Creek is a beautiful gated community offering the 18 hole championship golf course, clubhouse with restaurant, state of the art fitness center, resort style pool, tennis & bocce courts. This is an active golf and tennis community with only 456 residences set on 300 acres! The community has repeatedly won local and national awards for the beauty and maintenance of its grounds and common areas.